Lab funnels are necessary items to help make you more efficient. Transferring liquids without a funnel is not an easy task and could cause unsafe working conditions if you spill something. Instead of scrambling for the funnel the next time you need one, stock up! 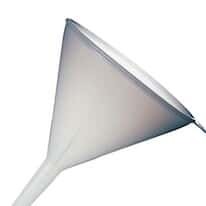 Our selection of lab funnels are suitable for laboratory and industrial applications. Choose from utility funnels and filtering funnels to autoclavable separatory funnels and high-capacity funnels.